Although your favorite Debian distro comes with many thousands of packages, some updated tools are still occasionally missing. Eventually, the maintainers might offer the corresponding packages themselves, but packaging these tools in a timely manner for each release of a distribution can be difficult. If you want to use a new version of a program that is not yet included in your current distribution, you can create a solution yourself without any expertise in building Debian packages. If the package sources for the old version are available, constructing packages from them for the new version is usually pretty easy to do. A positive side effect is that you have the opportunity to do something good for the open source community: Provide your packages to Launchpad  via a PPA (Personal Package Archive) and share the results of your work with other users. In this article, I describe an example of how to build a new, updated Debian package from old sources for the KDE backup software Kup. Most of your work will be in the terminal, because you'll be working in a chroot environment, which only makes sense from the command line. Basic knowledge of the command line's general functionality is therefore required, and you should be familiar with the important commands. The first step involves creating a suitable environment for constructing the package. Ubuntu currently uses the same package manager as is used in Debian, dpkg, so when I talk about "Debian packages," I am referring to archives for this kind of software management and not those that have been compiled for the Debian distribution. The option to build and compile packages for Dpkg directly on the system already exists, although it is frowned on for several reasons – the main being that the required development environment is often missing, and Ubuntu desktop installations do not usually include any developer packages. The compiler (GCC or G++) and the development files for the libraries on the system are thus missing. It might be possible to install all required packages later, but they would bloat the installation, and it would be more difficult to remove the installed software when you're done: Even the build-essential meta-package involves a good dozen packages as dependencies. Debootstrap is the better alternative: Using this tool you can create a virtual base installation of Ubuntu in the blink of an eye, which you can then access using the chroot command. Forget the tricks and gimmicks needed for bootloaders, because a simple environment does not act as a bootable system for the construction of packages. Doing so will install the required packages in the vivid-chroot folder. Depending on your Internet connection, downloading the required packages could take a while. The second line accesses the virtual Ubuntu system for the first time, and the next line adapts it to suit your needs. In fact, up to now you've only had a basic system with all the goodies missing. Therefore, the third command generates the locales, which can save some error messages if you don't speak American English (locale -a lists available locales), and the final command then sets up the developer packages you need within the virtual environment. An editor for the command line is still missing: The Nano or Vim package provides this function. Installing Wget also ensures that you can download files from the command line. Your setup now provides the basic functions for building packages. The next step is to download the Ubuntu package sources on which you want to base the new package version. Developers have often created program packages that are not yet officially available in a package manager; however, they don't usually keep up with new versions for current distributions. The backup program Kup  provides a perfect example: Kup has no packages for Ubuntu 15.04. The new version 0.6.0 is not packaged for Ubuntu, so you'll only find the old v0.5.1 from Ubuntu 14.10 on offer. What looks like a dead end at first glance is really an opportunity: You can simply use the old packages from Ubuntu 4.10 as a basis for the new packages. The challenge is that you need to find the sources for the old packages. The author, Simon Persson, supplies his software via KDE-look.org , which has a link to the project on the openSUSE Build Service . This service also produces Debian packages on request, and I have used this option on many occasions. At the time I was building a new Kup package, the table to the right on the Build Service page had xUbuntu_15.04 labeled as unresolvable, rather than the more desired succeeded; this informs you that Ubuntu 15.04 has no packages for the current version of the program. You need these three files so you can extract the sources and generate, together with the Debian changes, packages for version 0.6.0. Download the packages to the virtual chroot environment using wget and then extract the sources (Listing 1), which you will find in the ./kup-0.5.1/ folder. to extract the tarball. Finally, rename the newly created folder kup-0.6.0/. The folder with the extracted Kup 0.5.1 Debian package differs from that for the Kup 0.6.0 sources by the presence of a debian/ folder, in which resides all the files with the rules for creating a Debian package. For logical reasons, copy this folder from the kup-0.5.1 directory into the kup-0.6.0 directory. The above also sets the EDITOR variable to the desired value (Nano is the default in Ubuntu) to ensure the program uses your editor of choice. Once these variables have been set, the dch -i command causes the tool to create a new entry in debian/changelog with the correct email and name values; then, the file opens in the editor specified (Figure 1). 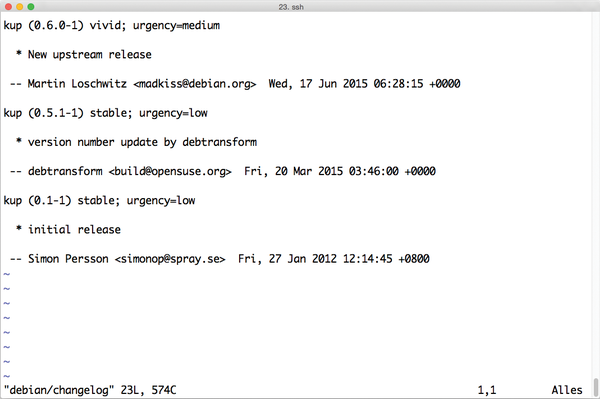 Figure 1: The dch command lets you update the changelog to reflect updates to a package. Correct the version number in the top line in parentheses – in the example, the new entry is 0.6.0-1 – and change UNRELEASED to vivid. This way, Launchpad knows the package is designed for Ubuntu version 15.04, and it builds appropriately for this platform. Use a brief description as the changelog entry – the example in Figure 1 is a reference to the new program version. 4. Uploading to the DEB package to the Launchpad auto-build.